An amputation injury requires experience and understanding. The medical field, while excellent in our community, is often difficult to navigate. 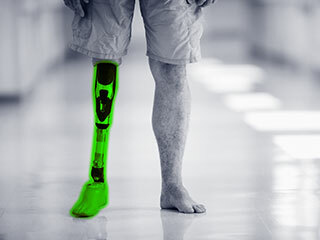 Furthermore, an amputation will have a life-long impact on the patient and will require long-term care, from physical therapy to prosthetics. The cost of these, added to possible lost wages, could be recovered if the right compensation claim is presented. Although the loss of limbs does not happen as frequently as other injuries, motorcycle riders are at greater risk of an accident that could lead to an amputation. At MotorcycleLawyer.ca, we are knowledgeable in the areas of partial and full amputation and know how to offer medical and social assistance to victims and their families. Finding the right professionals in the medical field to work with the individual and immediate family members is part of the legal process to ensure the best recovery possible and all aspects of the claim are properly documented. We help our clients navigate the complex medical and insurance system to find the most positive outcome in each particular case.